Advanced Cabochon Cutting provides instructions for cutting special shaped cabochons such as hearts, crosses, stars and teardrops. Additional material covers making cabochon backings and assembled stones such as doublets and triplets. Also covered are orienting and cutting cat's eye and star stones, as well as cutting opal and jade. Soft cover, 5.5" x 8.5", 64 pages. 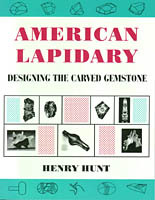 81.10.049 American Lapidary. Sorry out of print. The author of American Lapidary categorizes carved gemstones into three main groups: angular designs, curvilinear designs and mechanical designs. In this work Henry Hunt presents information and ideas in major chapters on designing the design, angular design, curvilinear design, lathe turning and milling, laminated and combination designs, and tool design. Among the many topics discussed in this book are designing and cutting the freeform faceted stone, carving with grooves, organic design, use of optic dishes, carving designs with holes, use of Cratex wheels, making milled cuts, circular designs, laminating a candy cut, working with combination forms, copper points, shaping with wood wheels, polishing tools, special diamond cutting wheels, making diamond compounds, photographing carvings, and much more. Soft cover, 7" x 9", 191 pages. The Art of Gem Cutting provides overviews and information regarding the equipment and techniques used in conventional cabochon cutting and facet cutting, as well as in more specialized operations involved in lapidary processes related to sphere, cameo and bracelet cutting. Soft cover, 5.5" x 8.5", 96 pages. Cabochons are gemstones with domed tops that are cut to various shapes such as ovals, circles, rectangles, hearts, etc. APrimarily materials that are opaque or translucent are uses for this purpose - stones like agate, opal, turquoise, star sapphire, petrified wood, obsidian and a host of others too numerous to list. With the same equipment that is used for making cabochons, small flat (or nearly flat) stones may also be cut and polished. And once the basics of cabochon cutting are learned, one may use this machinery for a variety of gemstone novelties, simple carvings, etc. 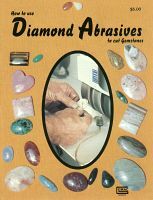 Contents include: Dopping Gemstones, Preparing Stones for Shaping, Grinding Gemstones, Smoothing Gemstones, Polishing Gemstones, Using a Trim Saw, Using the Slab Saw and Setting Your Cabochon Gems. Soft Cover, 5.5" x 8.5", 63 pages. 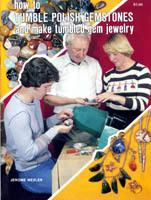 Gem Tumbling and Baroque Jewelry Making is a classic text providing a comprehensive introduction to the hobby of gemstone tumbling and making jewelry from tumbled gems. Covered are types of tumblers, grinding and polishing operations, gem materials suitable for tumbling, tumbler design, fillers and linings, correcting problems such a fracturing and poor polishing, and storage of grits and polishes. Covered in a section about making tumbled gemstone jewelry are selecting stones, adhesives, findings, and helpful hints for the shop. Also included is a table of speeds and grit quantities. Soft cover, 6" x 9", 58 pages. How to Tumble Polish Gemstones and Make Tumbled Gem Jewelry is a well illustrated text providing how-to for the beginning lapidary interested in learning to tumble gemstones and make jewelry from baroque stones. Covered are gemstones and gem materials suitable for tumbling and how to acquire them, abrasives and polishes used in the tumbling process, types of tumblers available and their applications, tumbling techniques, and how to make simple jewelry from tumbled stones. Soft cover, 8.5" x 11", 31 pages. Whether you are an experienced gem cutter, or are interested in getting into this fascinating hobby (or profession), important considerations are convenience and efficiency. These attributes are to be found in the use of diamond abrasives for the sawing, grinding, smoothing and polishing of gemstones. The "diamond way" is fast, clean and cool; equipment is compact, a benefit for those with limited space. Not so long ago few of these abrasives were available to the gem cutter, but today's advanced technology has resulted in a wide variety of diamond machinery, accessories and supplies. In this book you will learn how to use these aids to cut cabochons and small flat stones. Several methods are covered, so that you may select those that best fit your needs. The author's extensive experience in the field has enabled him to put together a set of instructions that will show you how to use the various types of diamond abrasives to cut beautiful gems with a maximum of enjoyment, convenience and cleanliness. Contents include Why Diamond?, Sawing Gemstones, Dopping, Grinding with Diamond, Smoothing and Polishing, Equipment, Accessories and Supplies and Special Techniques. Soft Cover, 8.5" x 11", 30 pages. 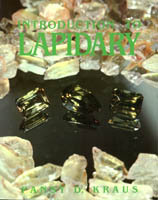 Introduction to Lapidary provides an authoritative introduction to all aspects of the hobby. the author describes the processes, tools and equipment of each branch of this fascinating hobby, helping the reader choose a technique, get started right away, and determine which tools will work best to achieve specific results. Described are the considerable rewards of tumbling rocks, making cabochons, carving gem materials, lapping, cutting spheres, making beads and faceting. Introduction to Lapidary provides a coherent overview of a vast and complex field, from the elements of getting started to studio visits with lapidary artists, discovering what is possible. The work of Olive M. Colbour, Jerry Muchna and Hing Wa Lee is depicted in 27 color plates, along with that of other artists featured in the studio visits. Soft cover, 7" x 9", 196 pages. Within the pages of Opal Cutting Made Easy you will successfully learn to cut opal step-by-step at your own pace. You will discover how to cut your first opal, orient the color, cut standard sizes, make doublets and triplets, treat matrix opal, cut Lightning Ridge black, Mexican and Boulder opal, buy rough and much more. Soft cover, 6" x 9", 97 pages. 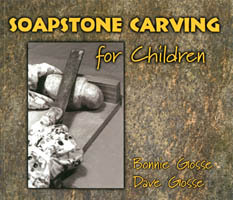 Soapstone Carving for Children is a how-to craft book with a difference. First, it is a family activities book; secondly combining history of the craft with the procedures of carving makes the book a high-interest source of enjoyment; and thirdly it provides sample projects and working drawings for children to develop on their own. Chapter One presents SoapStone Information and elaborates of Safety Procedures, Safe Carving and Tools. Chapter Two covers Carving a Project and is broken down into Choosing your rock, Sketching a working drawing, Putting the working drawing on your soapstone, Making a blocked-out figure, Making the saw cuts, Adding the second view, Making the general body shape, Perfecting the body shape, Smoothing with steel wool, Sanding, Waxing and Care and first aid. Chapter Three presents Simple Sketches for Projects. Chapter Four covers the History of Soapstone Carving in Canada and includes Where to buy soapstone and a Bibliograpy. Soft cover, 9" x 8", 48 pages.